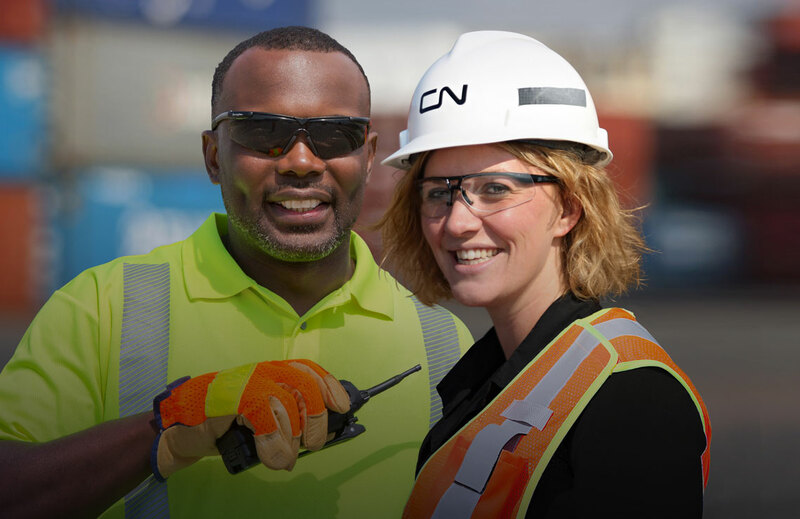 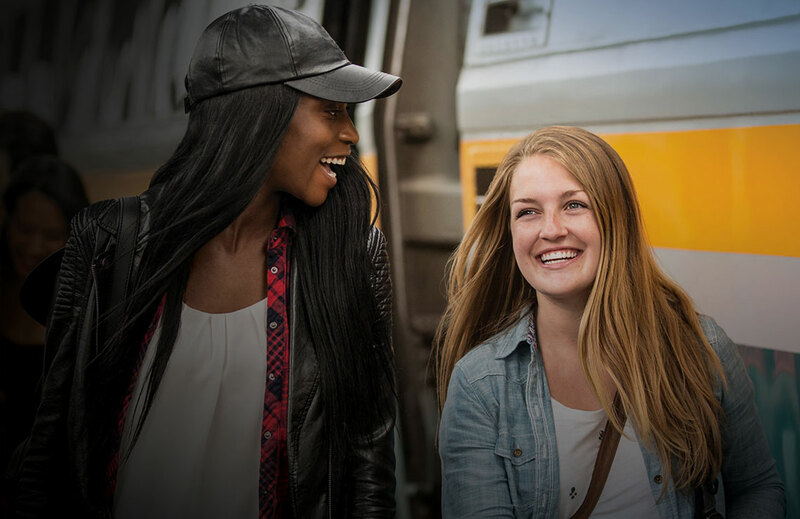 CN Rail is one of North America’s leading transportation and logistics companies. 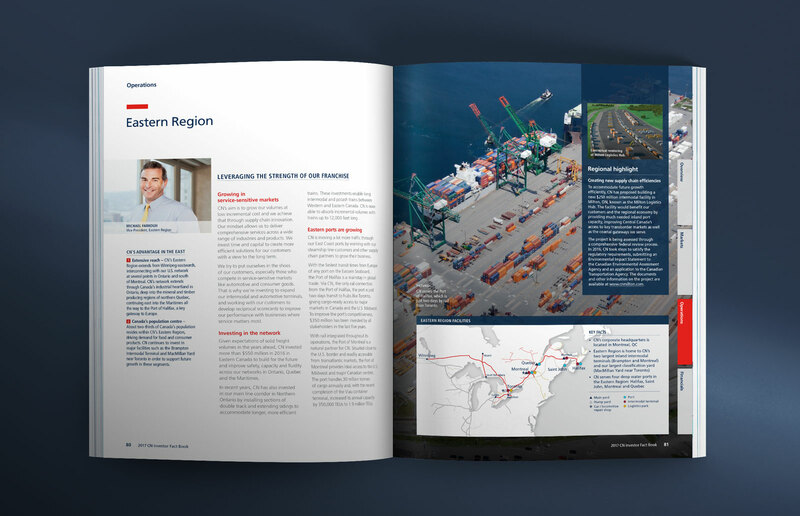 Its 19,600-mile network spans Canada and Mid-America, connecting ports on three coasts. 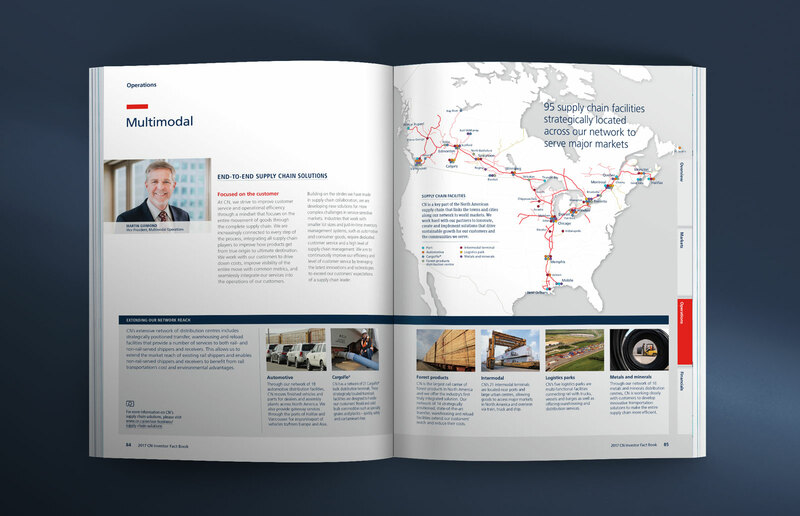 Its resource-rich, manufacturing-intensive network provides connections to consumers across North America, moving $250 billion of goods annually. 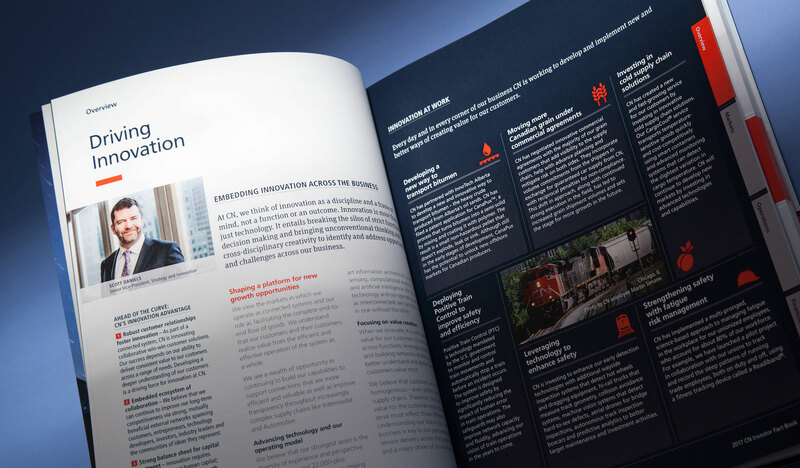 Capsule worked closely with CN in re-designing one of the company's key resources for investors, the Investor Fact Book. 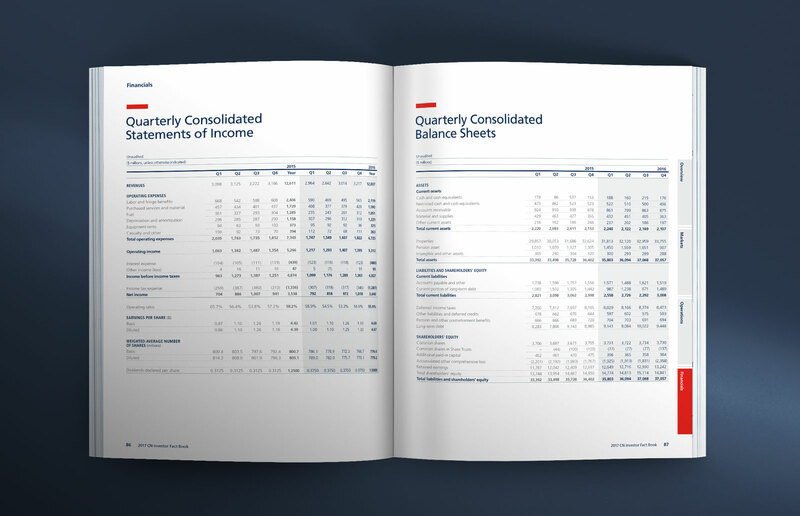 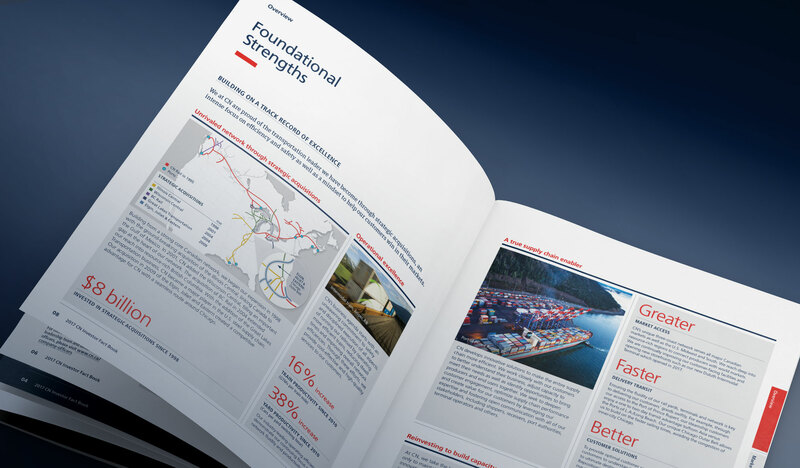 The Investor Fact Book provides a wealth of information about CN, their operations, markets and financials. 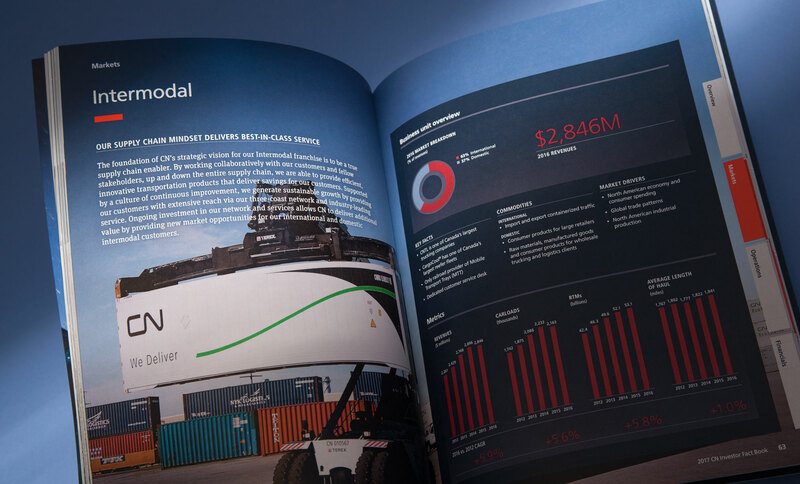 Beyond the facts, the book aims to provide investors with a better understanding of CN’s strategic vision to not only maintain its industry-leading position but accelerate the pace of innovation. 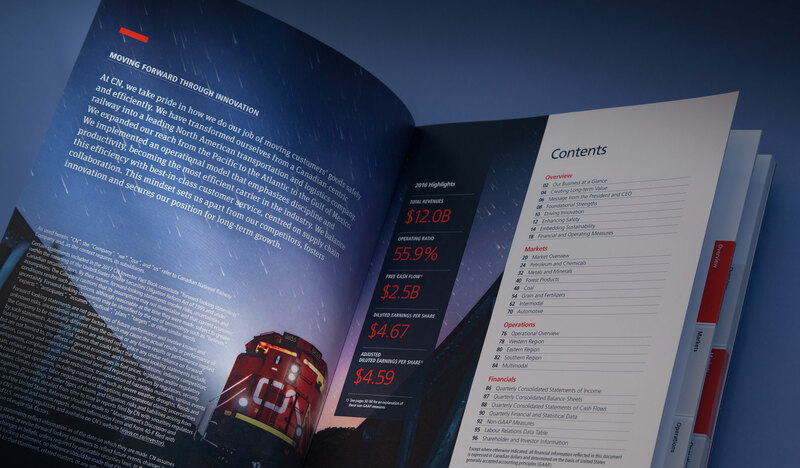 After research and peer review, Capsule embarked on a design that embraced a well-crafted layout and focused content. 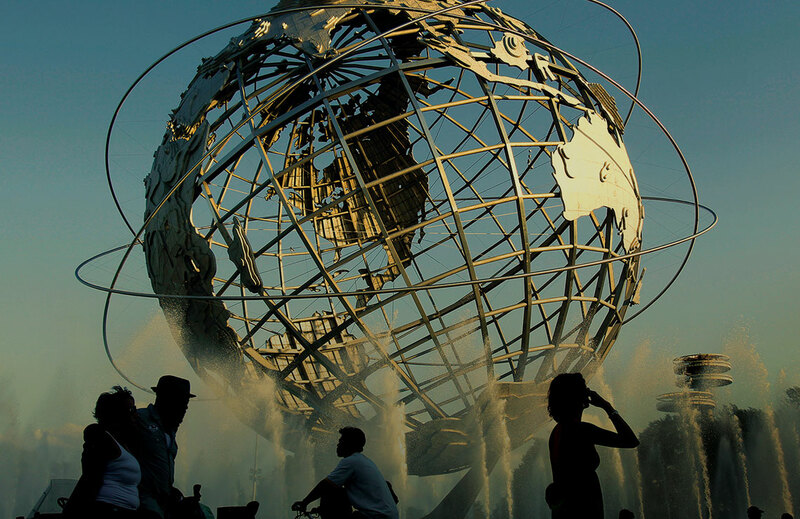 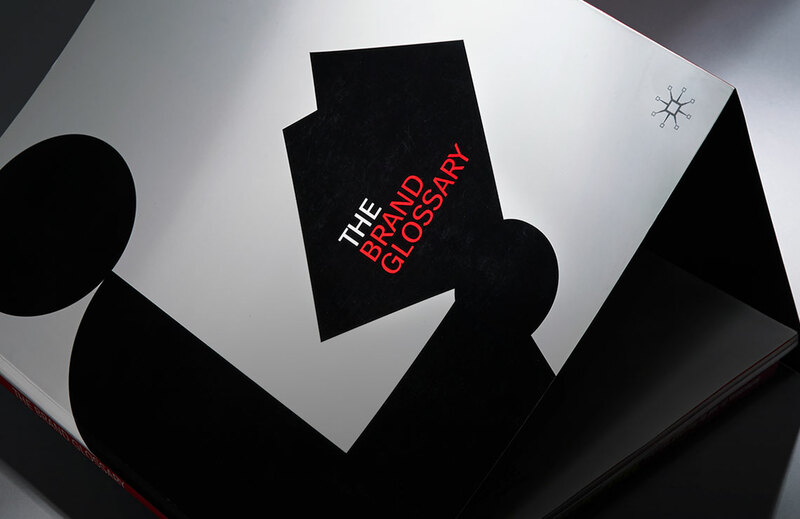 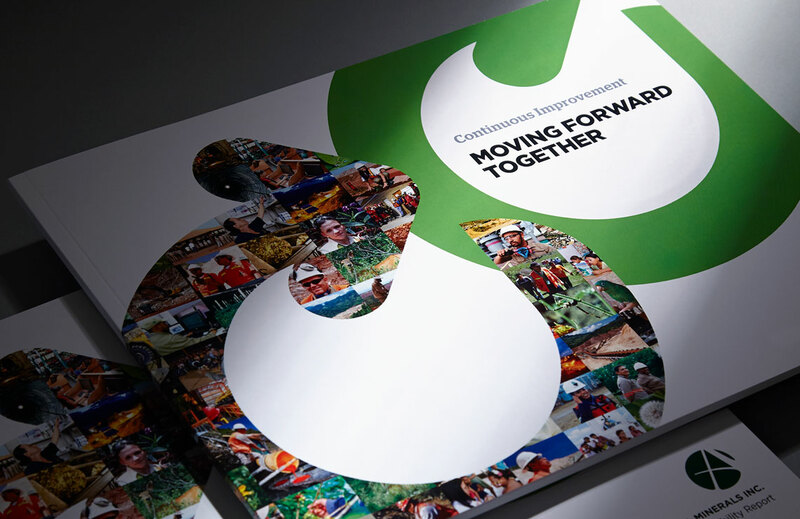 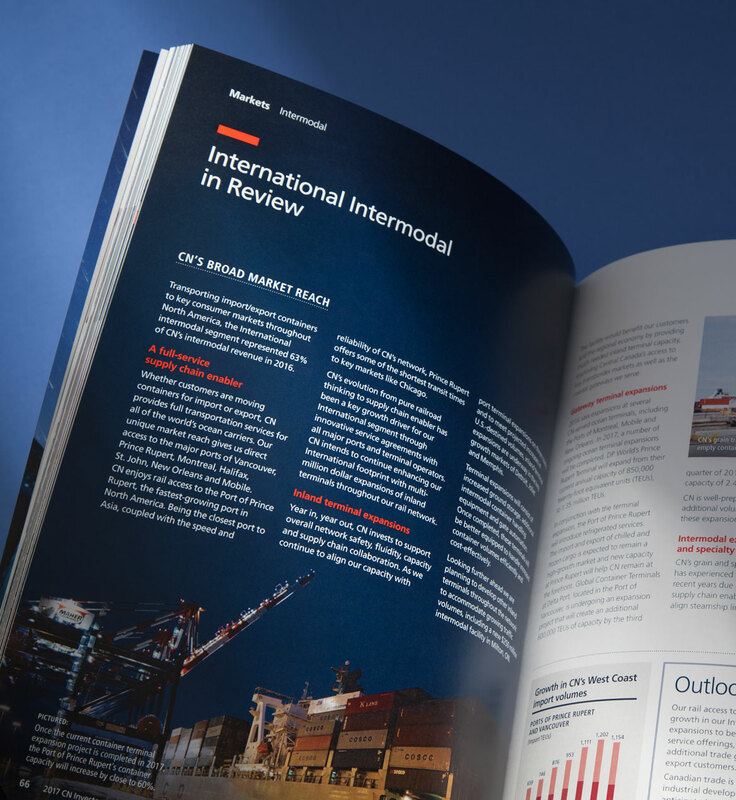 Employing an editorial style, the fact book engages the reader at every turn with a full range of graphic elements from large and small-scale photography, metrics, maps, and graphs – effectively bringing to life CN’s strategy, strengths, results, and market positioning for the future. 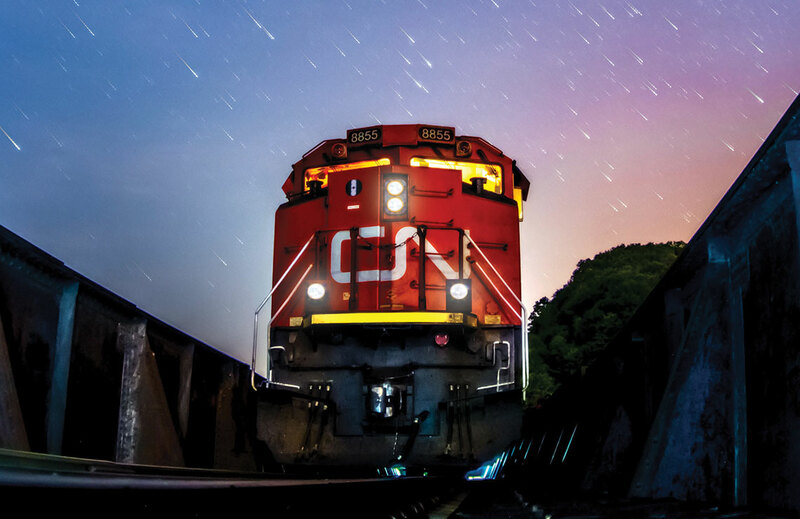 CN Rail is one of North America’s leading transportation and logistics companies. 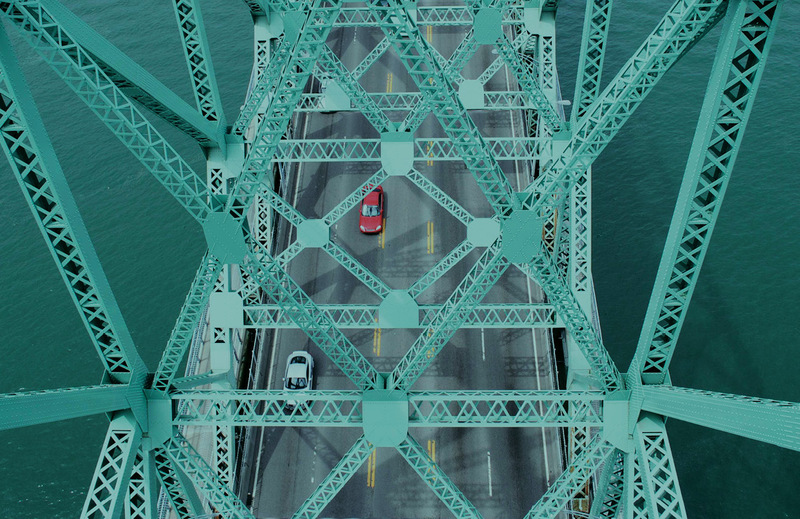 Its 19,600-mile network spans Canada and Mid-America, connecting ports on three coasts. 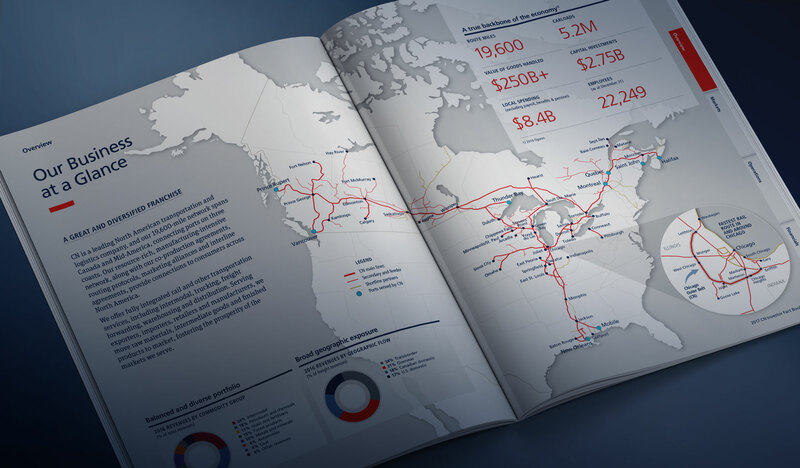 Its resource-rich, manufacturing-intensive network provides connections to consumers across North America, moving $250 billion of goods annually. 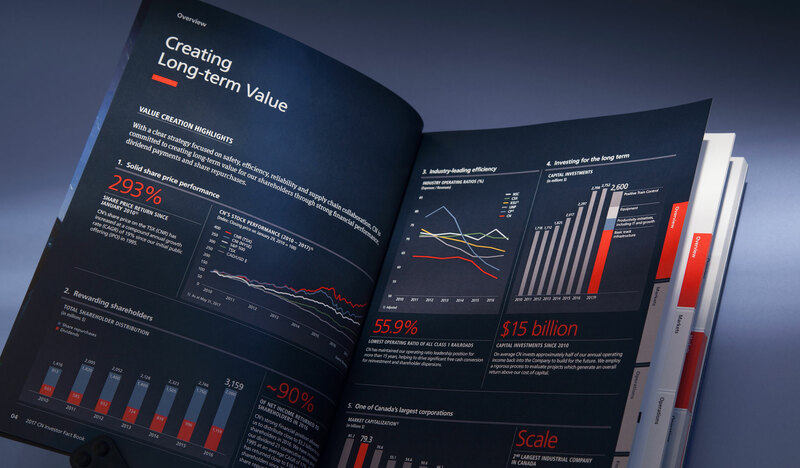 Capsule worked closely with CN in re-designing one of the company’s key resources for investors, the Investor Fact Book. 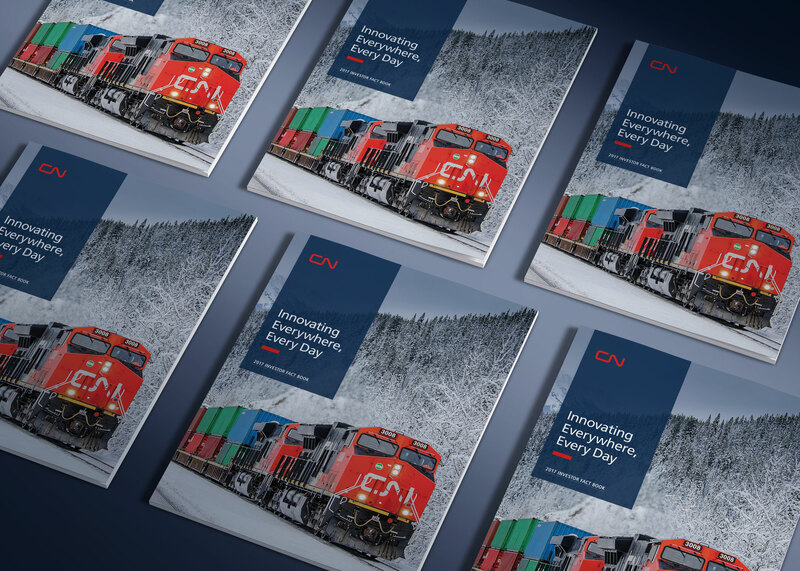 A four-page presentation summarizes CN's investment merits. 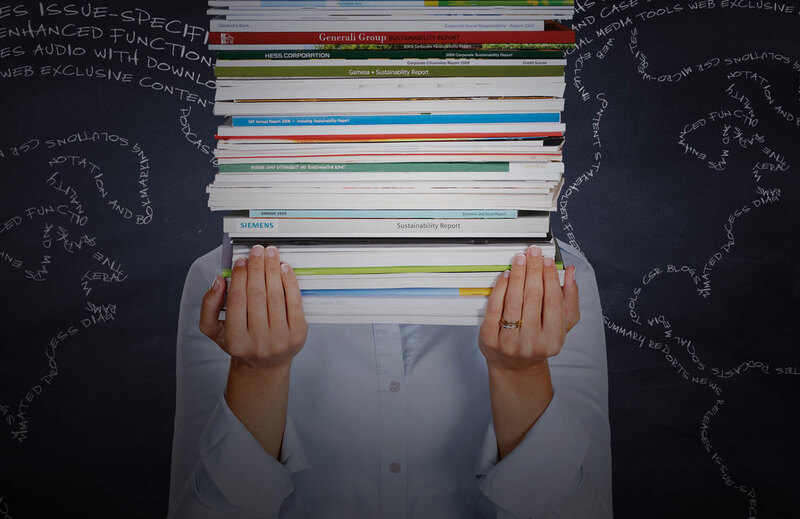 Metrics and graphs support the case. 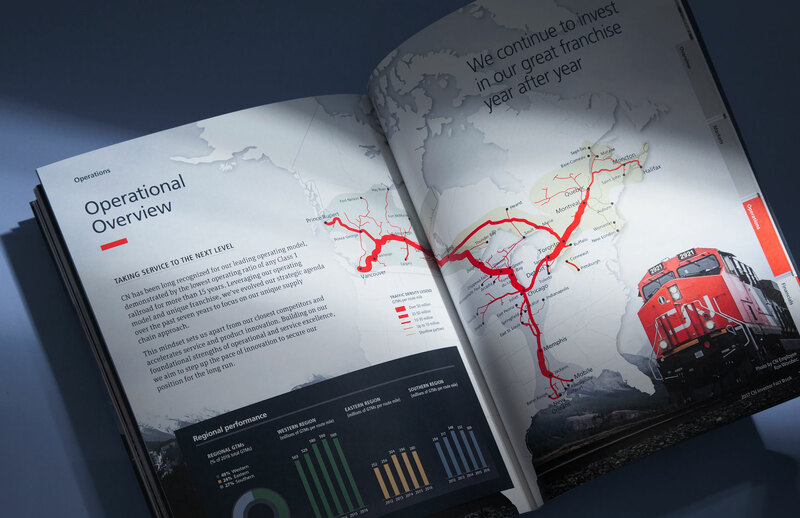 A section called "Driving Innovation" is the first of many features showing how the company is developing new and innovative ways to create value for its customers. 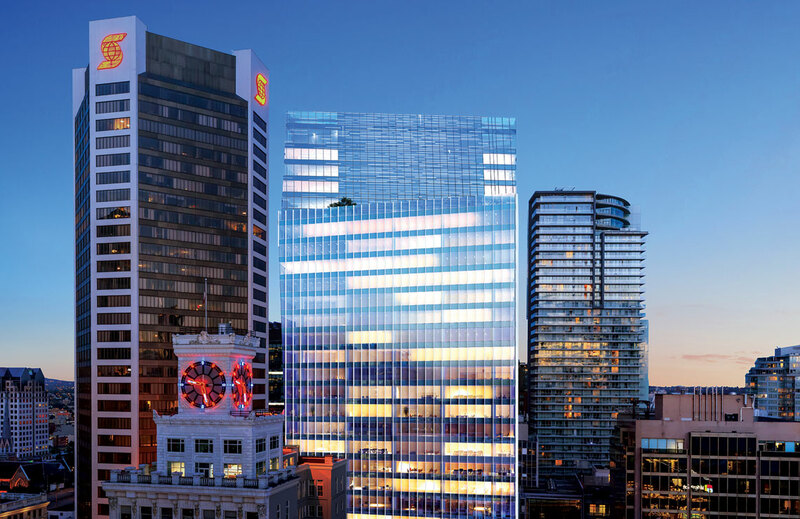 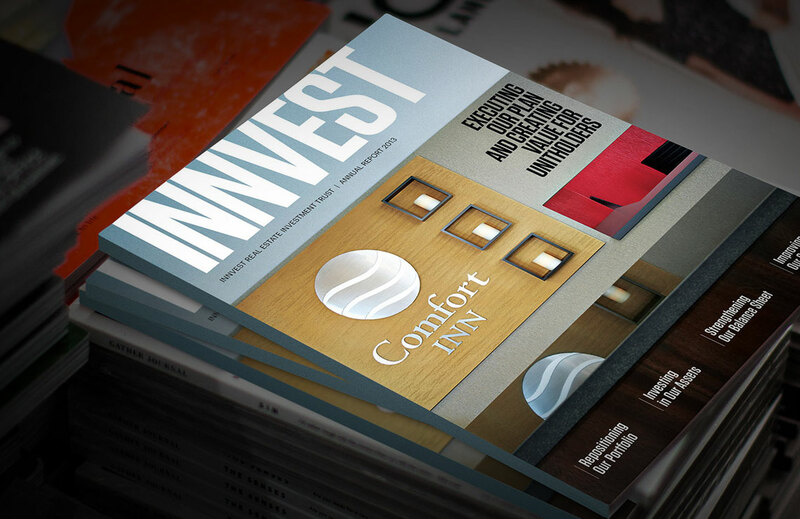 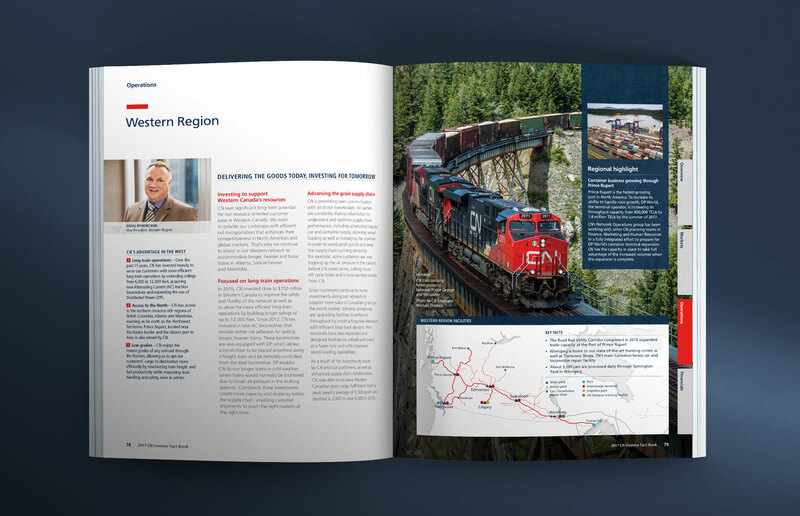 The 52-page markets section provides investors with key information to showcase CN's competitive advantage and market environment in a compelling editorial style. 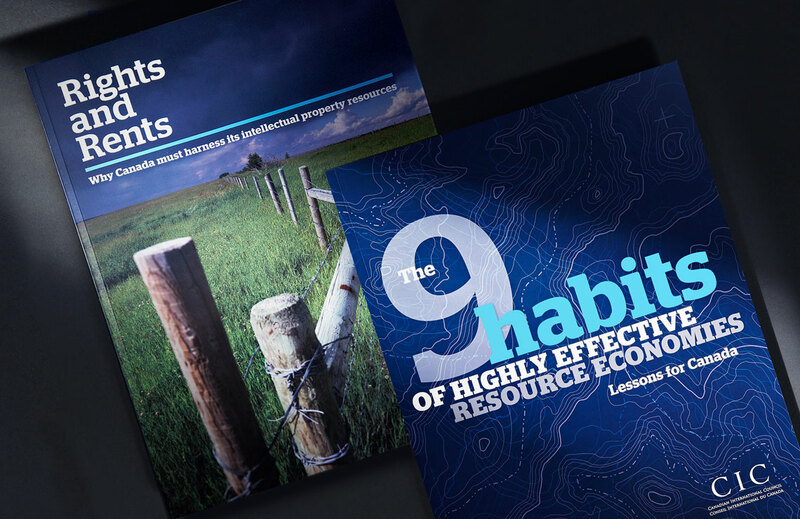 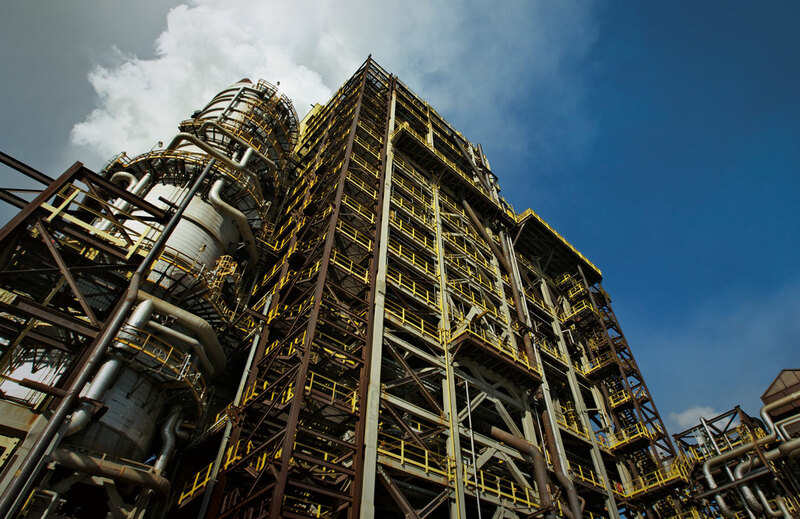 Each section leads with impactful photography serving as the backdrop to a succinct snapshot including key facts, commodities and market drivers, supported by 5-year performance graphs. 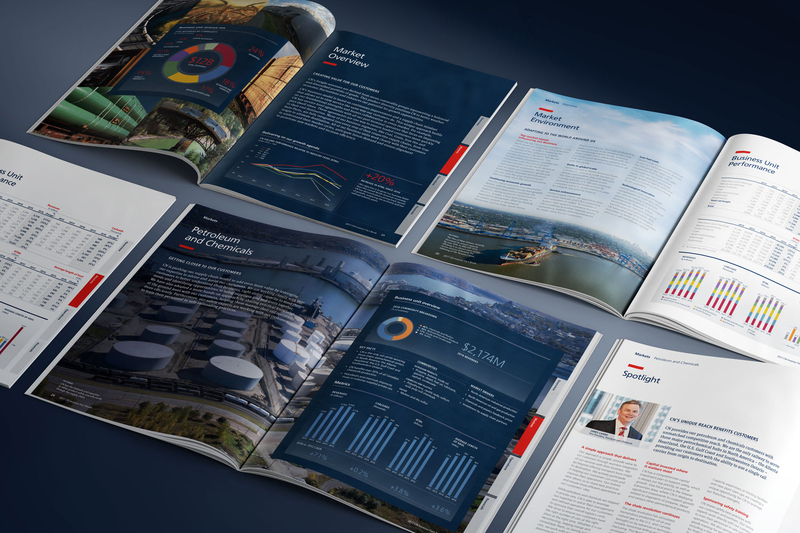 Executive commentary spotlights are supported with a mix of full-page features, smaller highlight stories, graphs, photography all to showcase CN’s market strengths. 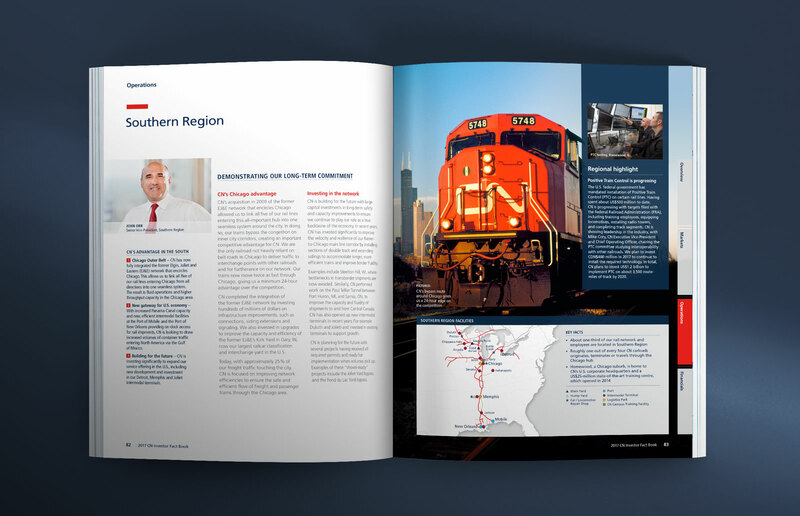 Focusing on CN's strengths, we included regional maps in the operations section to show valuable regional advantages like traffic density followed by concise commentary, including executive insight, key advantages, highlights in innovation.